Eid Al Adha is around the corner, and for many of us, it means a nice, long, weekend – maybe flying home, maybe somewhere exotic; but definitely somewhere cooler. But while you’re away for those few weeks, there’s a chance that some ‘guests’ may be making themselves comfortable in your home. So before you leave, it would be worthwhile to take some time out and do an inspection to rectify any issues that may result in pests calling your home…home. Pests like cockroaches and mice have ballerina-like flexibility. It’s best then to block off all potential points of entry by permanently sealing holes and cracks, no matter how small. You may be able to track down where pests are coming in now by following ant trails or mice droppings – but play it safe and block them all. A handyman can always help you with this job. Added bonus: you’ll increase the energy efficiency of your home! No holes means no leaks which equates to lower DEWA bills! Cockroaches, mice, ants, and all six-legged critters naturally gravitate towards your kitchen. You may think you’re being careful, but you will undoubtedly leave a few crumbs behind, some of which may have made their way below your fridge or cabinet. 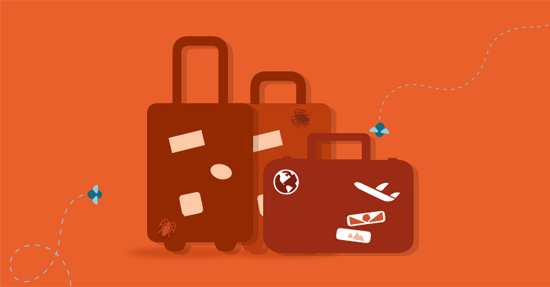 Before you head out to your vacation, throw out any food that may spoil while you’re gone. Food that needs to be refrigerated should, naturally, be put in the fridge. Any other food should be properly sealed in containers to make sure nothing can smell the food and get in. Best advice is to hire a cleaning service before you leave and do some deep cleaning not only in your kitchen, but the rest of your home as well. Crumbs are everywhere where you grab a bite to eat – the sandwich you munched on while you watched TV and the five-star breakfast you had in your bed will unquestionably leave a trace of crumbs beneath your couch or next to your bed. Just remember: just because you can’t see them doesn’t mean they aren’t there. Although most of us live in high-rises in Dubai and the UAE, many of us are still fortunate to live in villas with large backyards. But did you know the condition of your garden can also attract pests? Maintain your garden by removing any dead leaves, unused wood, and repairing any leaks. In the summer, water will attract all kinds of bugs and rodents, so no point in giving them a free pool to cool off in. Also take a look around your shed and deal with any areas that may naturally build up moisture. If you don’t have time for this, you can always hire a gardener to tidy up for you. Every single day, you open your door scores of times. Every single day, your shoes pick up whatever is on the streets and these hitchhikers come home with you. And every single day, your kids and your pets are out rummaging through the yard. You home is not a self-contained edifice. It’s open to the outdoor environment. Even your groceries can harbor pests (how many times have you found a spider or scorpion in your sack of potatoes?). Some common sense can prevent you from being a pest host. For example, wiping your feet before you come in, leaving your shoes outside, and making your home a no-go zone for bikes, scooters, skateboards, kayaks, and so forth. Since you’re away for a few weeks, it’s actually a great time to give a call to a professional pest control service in Dubai or the UAE. The pest control industry is heavily regulated in the country; for example, the provider must give you a 6-month warranty, the chemicals used must be approved by the relevant authorities, and the pesticides must be odorless and harmless to young children. A day or two before you leave, schedule a pest control service for a peace of mind. So here you go. Some great advice you should take to heart. You’ve earned your vacation, and you’ve also earned a comfortable return; not a welcome party hosted by a bunch of invasive cockroaches.